No matter how some media may want to spin it, Pope Francis won’t fit into the political categories of left or right, and he will challenge everyone with the truth of the Gospel, said the Vatican’s media adviser. 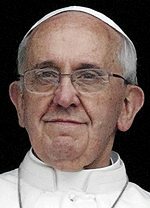 “Pope Francis is not a politically correct pope,” rather, he is “a loyal son of the church” who presents the hard truths with a heavy dose of mercy, said Greg Burke, senior communications adviser to the Vatican Secretariat of State. The former U.S. journalist, who has been based in Rome the past 25 years, gave a behind-the-scenes talk at the apostolic palace Oct. 18 to hundreds of benefactors celebrating the 30th anniversary of the founding of the Patrons of the Arts in the Vatican Museums. “We let the pope do his thing,” he said. Burke said he believes “the pope wants to get beyond left and right” by getting people to focus on the Gospels, on God and his truth and mercy. “He’s a loyal son of the church,” who sees its task as being like “a field hospital” that runs to and helps people who are hurting, he said. The pope is not advocating a “feel-good” religion of “I’m OK-you’re OK-Catholicism,” Burke said, but talks about the truth of the Gospel that includes mercy and forgiveness. “The Gospel is not there to make us feel good. The Gospel is there and makes very practical demands on us,” and one of those demands is to “tell people the truth and walk with them to the Lord,” Burke said. In his talk, Burke offered his take on decoding the pontiff with his own rundown of “Pope Francis in 10 Words”. 1. Mercy. The story of the Prodigal Son is a recurring theme, and the pope repeatedly says that God never tires of forgiving and welcoming his lost children back home. “The church is waiting here for you with open arms,” is the message, Burke said. 3. Margins and missions. Francis is continuing with his predecessors’ criticism of a world divided into the haves and have-nots. The pope “is not a fan of cheap grace and feel-good religion. He wants to see Christians who are not afraid to get their hands dirty,” Burke said. 4. Prayer. Non-believers often don’t notice how important prayer is for religious life. For example, Blessed Mother Teresa was often looked upon by the secular press as “a social worker wearing a habit.” But, he said, the pope has constantly been stressing the importance of prayer and urging people to pray. 5. Encounter. The pope is asking people to embrace a “culture of encounter” where they experience God and meet with others, including non-believers. This attitude of encounter and communion also starts at home, with your family, Burke said. 8. Simplicity and humility. Living in a Vatican guest house instead of the apostolic palace, carrying his own briefcase on a trip are just part of how the pope is and people will have to “get used to it because we’ll see more of it,” Burke said. 9. Compassion. Compassion and suffering with others is something Pope Francis has a knack for,” Burke said, and it’s especially evident when he embraces people and is totally present one-on-one with an individual, even in large crowds.